Hello my name is Oliver. I'm a coffee addict. OK, that may be putting it too strongly. Yes, there have been periods when I've abstained from drinking the dark black beverage. But there is just something supremely satisfying when that hot bitter taste (tempered by the smooth very slightly frothy milk) hits my discerning palate. Then that fruity, nutty aftertaste that lingers. And, of course, there is that all too familiar resulting jolt of caffeine kicking into my system. Caffeine as a central nervous stimulant almost always causes some symptoms: some beneficial when taken in moderation; others detrimental with over consumption (Pietrangelo & Cherney 2017). According to the U.S. National Coffee Association (2017), coffee was first discovered in the ancient coffee forests in the Ethiopian plateau by Kaldi—a goat herder. He noticed that after eating the coffee berries his goats became so energetic they couldn't sleep at night. Kaldi reported this to the abbot of the local monastery who made a drink from the berries and found that it kept him alert during evening prayers. The abbot shared his findings around. The use of coffee began to spread. It reached the Arabian peninsula where coffee began to be cultivated. By the 16th century coffee was not only consumed in homes but in qahveh khaneh—public coffee houses— in the Near East where people conversed, listened to music, played chess and kept up-to-date with current events. These coffee houses became key centres of exchanging information. They became to be known as Schools of the Wise. European travellers from the Near East brought back stories of this legendary wine of Araby. Coffee began to be popular in the European continent by the 17th century. Similar to what happened in the Near East, coffee houses in Europe became hubs of social activity and communication. By the mid-17th century, there were over 300 coffee houses in London where like-minded merchants, brokers, artists, sea farers and interlopers met to discuss ideas. Many business were born from these interactions. For example, Lloyd's—who laid the foundations of the global insurance industry & now the world's specialist insurance and reinsurance market— was born in Edward Lloyd's coffee house in London. In the mid-1600s coffee was brought into the New World via New Amsterdam—the great city we now know as New York. However, tea continued to be the most popular drink in the New World. That is until 1773 when the American colonists revolted against a heavy tax imposed on tea by King George III. This revolt which came to be known as the Boston Tea Party was pivotal not only in the birth of the U.S. as a nation of its own but also it's current preference for coffee as the hot beverage of choice over tea. Coffee— the favorite drink of the civilised world. My would-be coffee addiction is not helped by Sydney having so many places where one can get good coffee. 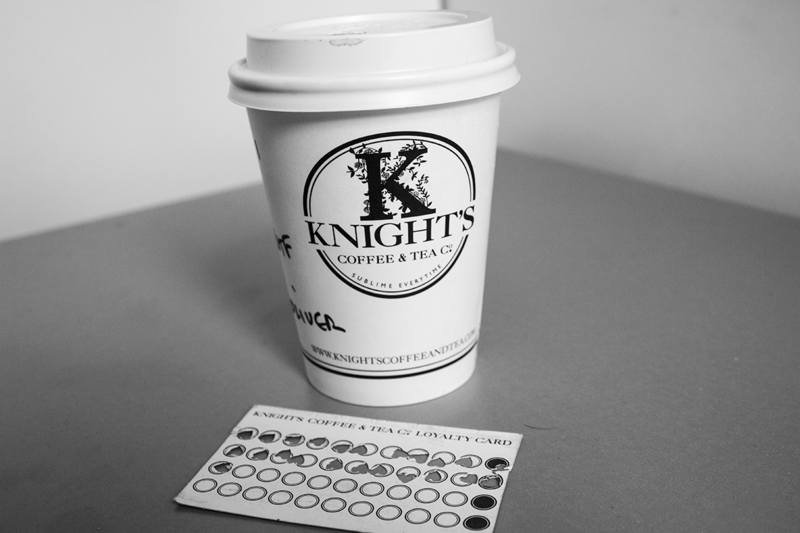 One of my go-to places for awesome coffee is Knights Coffee & Tea Co at Haymarket. The coffee is excellent. They use Campos coffee beans which has been one of my favourite beans since I discovered them when I lived in Newtown back in 2009. The customer service makes the coffee experience even better. The baristas of Knights Haymarket really know how to make the coffee the way I like it. Right now it's a large, extra–hot, flat white with full cream milk and NO sugar. The baristas are very friendly and professional in their service. It feels good to be known by name, and not having to explain how I want my coffee each time. They already know who I am and what I want. People can get all cyberspacy with the appification and VR-ification of everything. But to me, nothing can replace good old IRL human fleshy interactions. One can easily gauge how good the coffee and service is at Knights Haymarket by looking around. 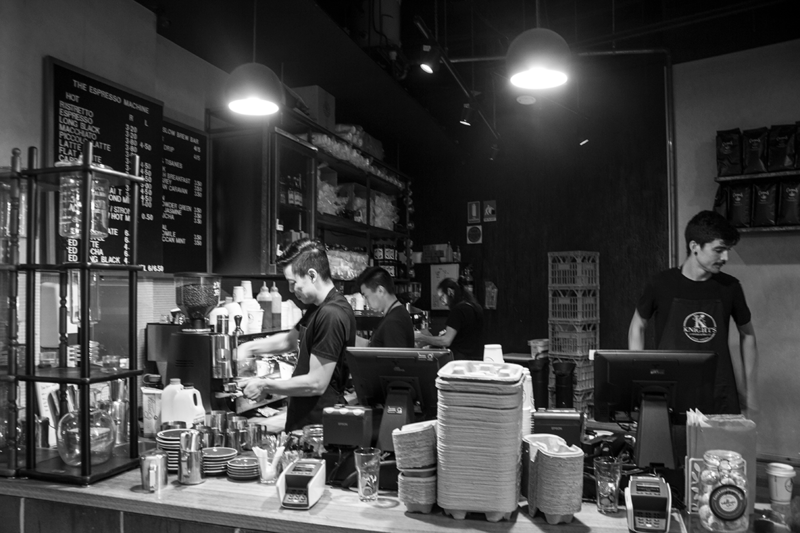 There are quite a number of places one can get coffee from—strewn along the Devonshire Street tunnel starting from Central Station and ending at the exit to the Ultimo Pedestrian Network which continues along to the Goods Line that links to Darling Harbour. Compared to these other coffee places, it is Knights Haymarket where one can see a consistent queue of people ordering and waiting for their coffees during coffee peak hours. Mind you, the service is very quick at Knights. However, at coffee peak hours the demand tends to be very high that it inevitably slows down supply. It wasn't that long ago when a flat white was rare as hen's teeth outside Australia and New Zealand. I remember being delighted to find a café serving flat white in London Bridge back in 2005. The café was, of course, run by an Aussie bloke who migrated to the UK. Now it's a different story. Last year I was able to order flat whites at Starbucks in among other places: Delft, Netherlands; and Santa Monica, California. Although not my favourite, and I had to get it there because it was nowhere else—in fairness—it was not bad, not bad at all how Starbucks did the good old flat white. Just remember to order with a double quantity of espresso or a darker roast to get the taste right. Their description of what a flat white is, is pretty nifty too: Bold ristretto shots of espresso get the perfect amount of steamed whole milk to create a not too strong, not too creamy, just right flavor. I guess the elephant question in the room needs to be addressed: so what the hell is the difference between a latte and a flat white? Well, they both have milk and espresso. But there is a difference. As what Anna Brones's research (2015) revealed to her, the stunning differences explained by a coffee expert boils down to these two things. Typically, in the specialty coffee world, a flat white has just a little bit less microfoam than a latte, and often less volume, but is still creamy milk over the same amount of espresso. The other difference is that a latte is generally served in a glass — though this differs from cafe to cafe — while a flat white is served in ceramic, also often in a smaller ceramic than a cappuccino, but again, this varies place to place. To me, it's the “just right” amount of milk and frothiness that sets a flat white apart from a latte. There you go. I guess, it's time for me to get another flat white. Thank you for reading. Agarwal, R. 2014, '25 Years After Its Birth, The World Wide Web Becomes Appified', Wired Insights , weblog, viewed 14 November 2017, <https://www.wired.com/insights/2014/03/25-years-birth-world-wide-web-becomes-appified/>. Brones, A. 2015, 'Wait, What Exactly Is a Flat White? We Asked an Aussie and a Kiwi', kitchn , weblog, viewed 14 November 2017, <https://www.thekitchn.com/wait-so-what-is-the-deal-with-a-flat-white-smart-coffee-for-regular-joes-215613>. Campos Coffee, 2017, 'Quality Coffee Cultivated by Good', Campos Coffee , website, viewed 14 November 2017, <https://camposcoffee.com/our-story/cultivated-by-good/>. Cherney, K. & Pietrangelo, A. medically reviewed by Olsen, N. 2017, 'The Effects of Caffeine on Your body', Health Line , website, viewed 14 November 2017, <https://www.healthline.com/health/caffeine-effects-on-body>. Knights Coffee & Tea Co, 2017, Knights Coffee & Tea Co , Facebook Page, viewed 14 November 2017, <https://www.facebook.com/KnightsCoffeeandTea/>. Lloyd's, 2017, 'About us > About Lloyd's > History', Lloyd's , website, viewed 14 November 2017, <https://www.lloyds.com/lloyds/about-us/history>. Lloyd's Register, 2017, 'Edward Lloyd and his Coffee House' Lloyd's Register , website, viewed 14 November 2017, <http://www.lr.org/en/about-us/our-heritage/brief-history/edward-lloyd-coffee-house.aspx>. National Coffee Association, 2017, 'The History of Coffee', National Coffee Association , website, viewed 14 November 2017, <http://www.ncausa.org/About-Coffee/History-of-Coffee>. Property NSW, undated, 'The Goods Line', Darling Harbour , website, viewed 14 November 2017, <https://www.darlingharbour.com/things-to-do/the-goods-line/>. Starbucks, undated, 'Flat White', Starbucks , website, viewed 14 November 2017, <https://www.starbucks.com/menu/drinks/espresso/flat-white>. Thomas Jefferson Foundation, Inc., 2017, 'Coffee', The Jefferson Monticello , website, viewed 14 November 2017, <https://www.monticello.org/site/research-and-collections/coffee>. Wayne, M. 2013, 'Devonshire Street Cemetery / Central Station, Sydney, NSW', Past/Lives of the Near Future—Revealing traces of a former Sydney , weblog, viewed 14 November 2017, <https://pastlivesofthenearfuture.com/tag/devonshire-street-tunnel/>. Urban Dictionary, 2004, 'IRL Top Definition', Urban Dictionary , website, viewed 14 November 2017, <https://www.urbandictionary.com/define.php?term=IRL>.